I've had a lot of visitors this year coming by looking for ideas and inspiration for setting up makerspaces at their own schools. The big issues are usually about how to maximize space and how to get the most out of a limited budget. I thought it might be helpful to start blogging about the stuff that I have in my room and talk a bit about how I have been using it. I hope to get a new post up every couple of days. Each time, I will try to feature a new piece of equipment. Today, i will kick things off with my 3D printers. 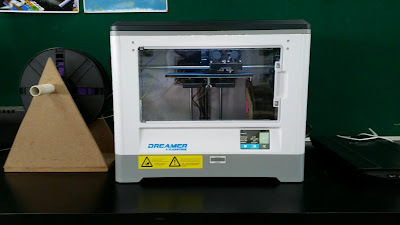 I have two Flashforge Dreamers. I bought them from Simplifi3D in Singapore. They have been great. Nearly bulletproof. I haven't had to service them at all. I have had consistently good prints with both PLA and ABS. 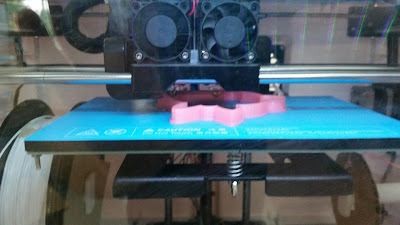 The machine comes with two extruder heads, but I rarely use both extruders at the same time. Instead, I just keep a different colour in each one so students have a choice. I like that the machines are enclosed so that little fingers don't end up where they shouldn't. The software is easy to use (almost a clone of the Makerbot software, indeed the machine itself is based on the Replicator 2) and i have had no trouble teaching it to other teachers and to students. For those people thinking about investing in a 3D printer, this is essential. You could spend hours and hours printing other people's stuff, checking their models etc... so you really need to train up some people quickly. 3D printers are slow. These are no exception. If you want to run a 3D modelling unit with an entire class, give yourself a week to get all of their models printed. If you do a whole grade level, you can't possibly print one for every kid. Right now, I am working with a grade one class. 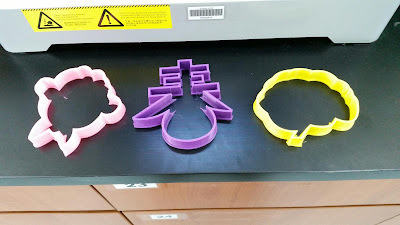 We are designing cookie cutters. they are using a great online tool (free) called Cookiecaster and even for grade one, it's a piece of cake. There is a short tutorial and after the kids did that. they were up and away. In a single lesson, they all managed to make something decent. I had them in pairs and groups of three. Since it's the Year of the Monkey, there is a monkey-shaped cookie cutter on the left. The middle one is the Chinese character for Spring (chun). The one on the right is a brain. TinkerCAD is another online program for creating printable 3D models and it's really easy to use. Grade 2 kids used it to create custom nametags and it took no time at all to teach them to use it. Earlier this year, I did some architectural design stuff with grade 5 kids using SketchUp and their buildings printed pretty well. As an educator, you can request an upgrade to the pro version which makes it really easy to export your files in .stl format, which is the format used in 3D printing.If you only have handhelds, Autodesk has a 3D sculpting program called 123D Sculpt that is really easy to use. The new version, 123D Scuplt+ is not nearly as easy to use, so I recommend grabbing the previous version from the app store while it's still available.The machine that you choose does make a big difference. The first machine I got was from a startup and the machine was called Makibox. The machine was a complete disaster and the company went out of business shortly after I received it. It's now a $300 paperweight. At the other end of the spectrum, we also bought 3 5th generation Makerbots that were also a disaster. They all failed and since the design of the machine is all proprietary, you can only get parts from the manufacturer and almost any attempt to fix the machine yourself will void that warrantee (including using plastic filament made by anyone else!) Those machines are now $5000 paperweights. So it's important to do your research. make sure you buy something with local support. Buy something based on open source hardware so you can easily replace parts.Or, check out the Reprap and try your hand at building one of your own. Using the parts from my dead Makibox, that's my next project. I will be sure to post my progress once I get started. In the meantime, I would love to hear about your 3D printing experiences in the comments.